For quantitative determination of ketone body (acetoacetate and 3-hydroxybutyrate) and evaluation of drug effects on its metabolism. • Sensitive and accurate. Uses 10 μL sample. 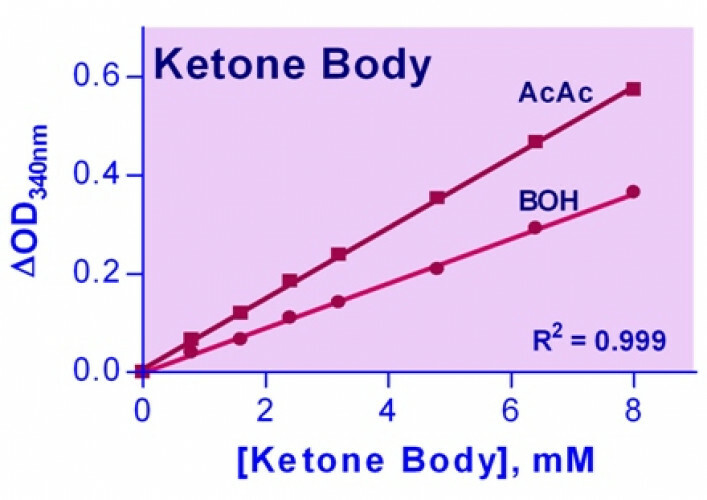 Linear detection range of 0.12 to 8 mM for each ketone body in 96-well plate assay. • Convenient. The procedure involves adding a single working reagent, and reading the optical density at room temperature. • High-throughput. Can be automated as a high-throughput 96-well plate assay for many samples per day. Applications For quantitative determination of ketone body (acetoacetate and 3-hydroxybutyrate) and evaluation of drug effects on its metabolism. References Assay: Ketone Body in Rat Hepatocyte culture (Pubmed). 2. Sharma NS et al (2011). Metabolic profiling based quantitative evaluation of hepatocellular metabolism in presence of adipocyte derived extracellular matrix. PLoS One 6(5):e20137. 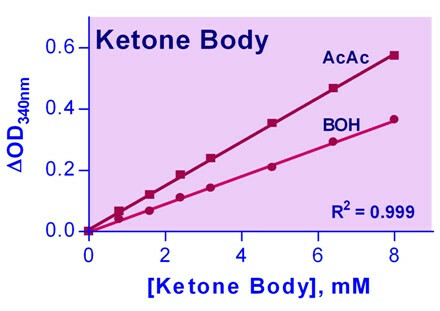 Assay: Ketone Body in Human Serum (Pubmed). 1. Klusonova P et al (2011) Local metabolism of glucocorticoids in Prague hereditary hypertriglyceridemic rats--effect of hypertriglyceridemia and gender. Steroids 76(12):1252-9. Assay: Ketone Body in Rat Hepatocyte culture (Pubmed).